This comprehensive examination of high frequency trading looks beyond mathematical models, which are the subject of most HFT books, to the mechanics of the marketplace. In 25 chapters, researchers probe the intricate nature of high frequency market dynamics, market structure, back-office processes, and regulation. They look deeply into computing infrastructure, describing data sources, formats, and required processing rates as well as software architecture and current technologies. They also create contexts, explaining the historical rise of automated trading systems, corresponding technological advances in hardware and software, and the evolution of the trading landscape. 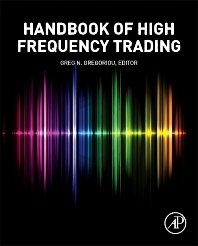 Developed for students and professionals who want more than discussions on the econometrics of the modelling process, The Handbook of High Frequency Trading explains the entirety of this controversial trading strategy. Upper-division undergraduates, graduate students, and professionals working in asset pricing, investments, and financial institutions. Chapter 2. The Profitability of High-Frequency Trading: Is It for Real? Chapter 13. We Missed It Again! Why Do So Many Market Orders in High-Frequency FX Trading Fail to be Executed?